Handmade Baseball Table Top Lamp with Handmade Sports Lampshade. 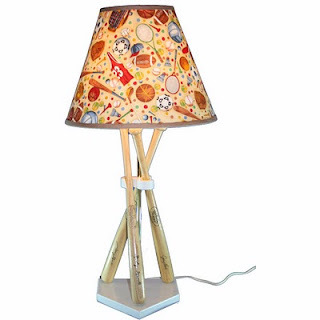 A sports themed lamp that would be perfect for any child's bedroom desk or dresser. This lamp measures 26" high with a handmade sports lampshade. The ivory cord is 72" long (6') and a 40w or 60w light bulb would be appropriate for the handmade shade. The single turn socket, 7" harp, and finial are gold color. The hardback, fabric lampshade measures 6" top x 13" bottom x 10" high, has pictures of basketballs, soccer balls, baseball gloves, baseballs, baseball bats, tennis balls, tennis rackets, badmitton birdies, golf bags, golf balls, golf tees, golf clubs, and sports tank tops on a beige background with tiny white dots. Johnny Bench, Mickey Mantle, and Jason Giambi have their signatures engraved on the three Louisville Slugger mini bats; and the baseball diamond was made in proportion to the signed bats. You can own this one-of-a-kind, handmade lamp by going to http:www.shades-etc.com/sports.htm and purchasing through my secure shopping cart. Your blog is great, keep up the good work. I thought information was very helpful and I appreciate the time you took to write this blog. This is really one cute lamp. I really love it. And at $125, I guess this is really a pretty great deal.